2015 Ferrari 488 GTB revealed - engine details and on-sale date | What Car? This is the new Ferrari 488 GTB, the replacement for the Ferrari 458 Italia range. The 488 GTB is Ferrari’s latest supercar. It gets a turbocharged engine, the first time this has happened in this type of Ferrari. It is effectively an updated and overhauled version of the 458 Italia, the model it replaces in the Ferrari range. 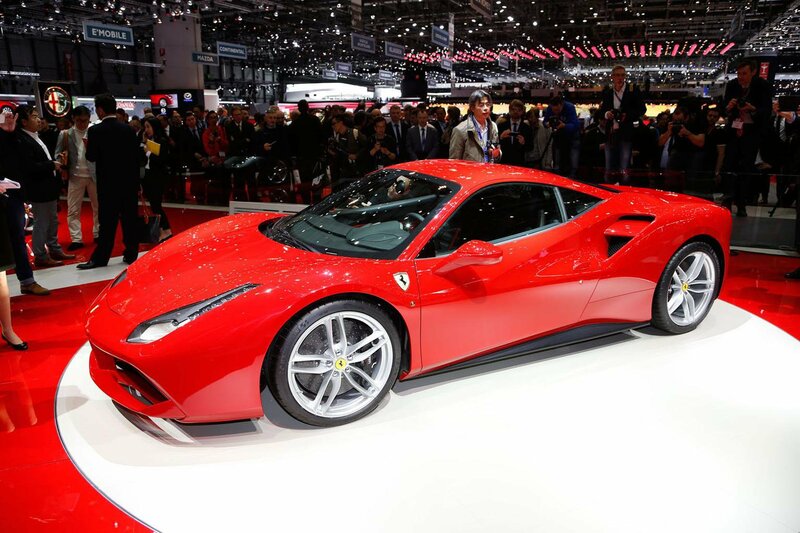 The 488 GTB will go into production in September after production of the 458 Italia range ends in the summer. The only engine offered in the 488 GTB is a new twin-turbo 3.9-litre unit, which is different from the turbocharged V8 engine used in the Ferrari California T.
The engine produces 660bhp at 8000rpm and 560lb ft at 3000rpm. Both outputs are increases over the 4.5-litre V8 used in the Ferrari 458 Italia and Ferrari 458 Speciale. The 0-62mph time of the 488 GTB is 3.0sec, and its top speed is 205mph. The CO2 emissions are 260g/km and economy is 24.8mpg, both of which are improvements over the 307g/km and 21.2mpg figures in the 458 Italia. A stop-start system called HELE is fitted as standard to the 488 GTB. The 488 GTB is fitted with several advanced driver assistance systems as standard, designed to allow the driver to exploit the car’s performance. These include a traction control system called F1-Trac, an electronic differential called E-Diff, and a function that allows the driver to oversteer the car called SSC2. The interior has been redesigned to be made more usable, including new switchgear, air vents and instrument panel. The multifunctional steering wheel remains, while the infotainment system gets a new interface and graphics. Ferrari has yet to confirm pricing. We’d expect an increase over the £178,851 458 Italia it replaces, however. How good are its rivals? The 488 is in very good company. There is now no longer such a thing as a bad car at this price point, as rivals like the Porsche 911 GT3, McLaren 650S and Lamborghini Huracan prove. The 488 GTB will also need to be very special indeed to trump the Ferrari 458 Speciale, our Best Buy 2015 for sports cars costing more than £100,000, and a car we say is simply as good as cars get in the right conditions. The engine gives the 488 its name, because the cubic capacity of each of the engine’s eight cylinders is 488cc. The GTB suffix, standing for Gran Turismo Berlinetta, is a hallmark of previous mid-engined V8 Ferraris such as the 308 GTB. This naming strategy is different to the 458 Italia. The ‘45’ referred to the 4.5-litre engine capacity, and the ‘8’ to the amount of cylinders it had. Learn more about the 488 GTB from Autocar's video, below.